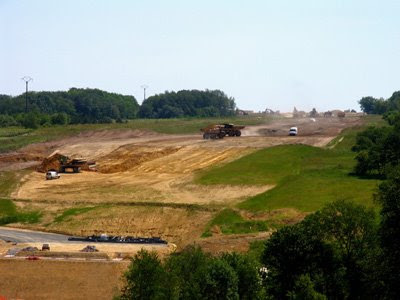 Brief report in La Nouvelle Republique today about L'association Bien Vivre à Nazelles-Négron, a suburb of of Amboise, whose members are seeking more information about the projected new autoroute that would by-pass Tours and be designed to relieve the heavy traffic on the existing A10 as it passes through Tours. At busy times, especially during the heavy summer weekends, the autoroute around Tours can turn into one large traffic jam. Apparently three possible routes close to Amboise, north and south, are being considered. Le Detour, Bléré opens Monday – deviation obligatoire! The eagerly awaited opening of the bar/restaurant Le Detour on the D976 in the hamlet of Thoré close to Bléré is due on Monday evening. Formerly called Le Marechal, the new proprietors, Laurence and Philippe, have completely renovated the establishment which is about 300 metres east of the roundabout at the eastern end of the Bléré by-pass. See earlier report on the renovations. Jim's Loire will have an ace reporter at Monday night's opening, so expect a full report early next week. The names of the 29 Sauvignon Blanc Ambassadors 2009 chosen at the tasting led by Sam Harrap MW in Tours (19th-20th February) will be published on Jim's Loire on Tuesday 3rd March. See reports here and here. Report on vist on 31st January 2009 now complete. I know they are not in the Loire but these are my two favourite restaurants in and near to Lisbon and to go to the two on consecutive days has been a really treat. After all Lisbon does begin with an L! 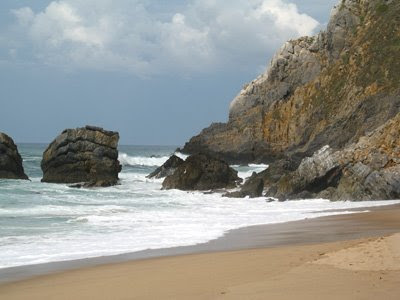 First to the restaurant at Praia da Adraga, which is on the Atlantic coast not far from Sintra and one of the most westerly points in Europe. 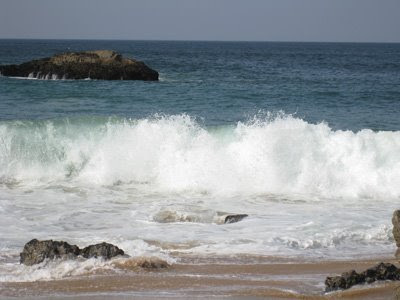 Adraga is a small unspoilt cove, down from the village of Almocageme and the one restaurant does sensational grilled fish, as well as crab and clams. The clams are best done in the style – ameijoas à bulhão pato: a little like a moules marinières with garlic, coriander and a little chilli. Nothing is fancy here but everything is brilliantly and perfectly cooked. Yesterday the restaurant was quiet and we were lucky to have a table by the window, which gives you a sensational view out over the sandy beach and the Atlantic Ocean – next stop the US of A. Ameijoas à bulhão pato to begin with followed by grilled sea bass for two with a fine bottle of 2007 Muros Antigos Alvarinho Vinho Verde. In the Loire the natural choice would be a good bottle of Muscadet but this is a most acceptable substitute. Difficult to see how life could get better. Then this evening off to O Galito in Carnide, now a suburb of Lisbon but which once must have been a quite village away from the bustle of Lisbon. Here you will find wonderful Alentejo cooking married to a sensational wine list. Dona Gertrudes remains in charge of the kitchen while her son is increasingly ceding the front of house to his energetic son. It's a small restaurant, so essential to book on Saturdays and probably very wise for the other nights of the week. 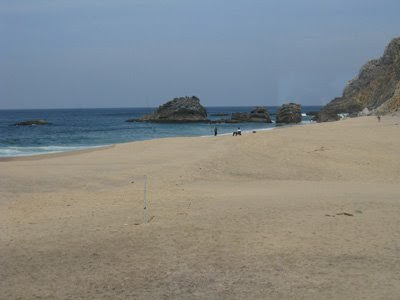 It is also open at lunchtime but closed Sundays and for holidays. Tonight we enjoyed sopa de cação (shark soup) then migos de espargos c/ lombo porco alentejano grelhado (migos is a bit like a light bread dumpling and, in this case, mixed with asparagus). Also another delicate pork dish this time with rice and coriander. We started with a very fine bottle of 2006 Pêra-Manca white (Adega Cartuxa) from Évora in the Alentejo and made from Arinto and Antão Vaz. All in all – concentration, complexity and minerality. 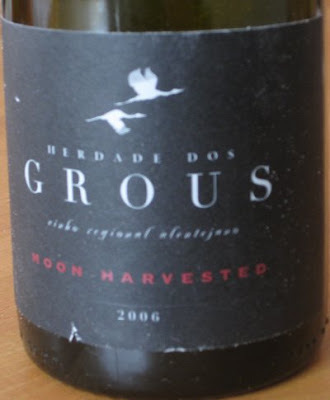 For the red we had another wine from the Alentejo – the 2006 'Moon-harvested' Herdade do Grous. Naturally deep coloured as 100% Alicante Bouchet this is a big, rich wine but a little lacking in complexity, although it did develop in the glass. 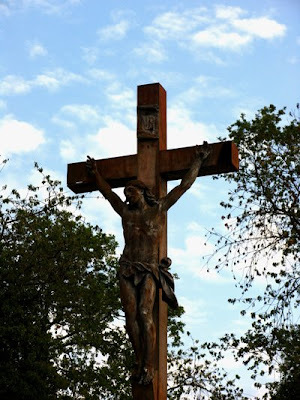 Easily reached by the Metro (Carnide) O Galito is highly recommended. La Nouvelle République today has a report on the poulets fermiers of Orléans. 160 farmers belong to the Orléans chicken farmers' organisation (la Coopérative agricole des fermiers de l'Orléanais). Of a total annual production of 4.3 million chickens – 90% have the label rouge. 36% of the production is in Loir et Cher, with 4% each in Indre-et-Loire and the Cher. 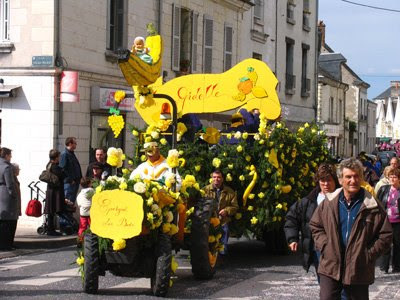 In 2007 the organisation was asked to look after the production of the famous Géline de Touraine, the Loire’s finest chicken and on a par with a Poulet de Bresse. Further information about the Géline and its rescue from extinction can be found here. 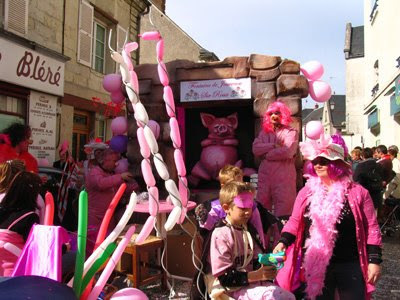 There is also a report on the forthcoming carnival at Blére – Sunday 29th March with a parade starting at 3pm. 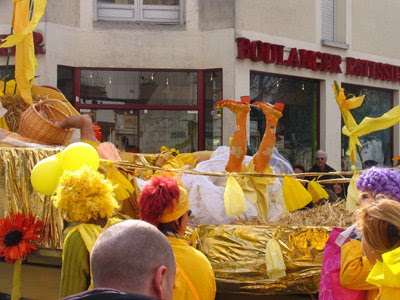 This is a bi-annual event that involves all the communes around Bléré including Epeigné-les-Bois, Francueil and Luzillé. 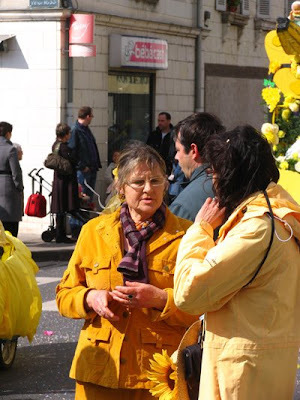 The previous edition was on 1st April 2007 and certainly worth going to see. There is now a carnival blog. 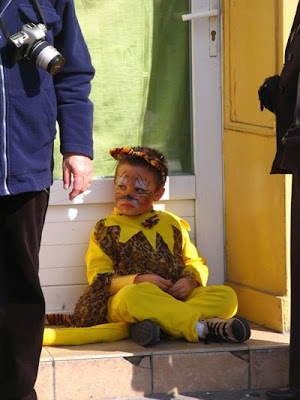 More photos of the 2007 Carnival on flickr. 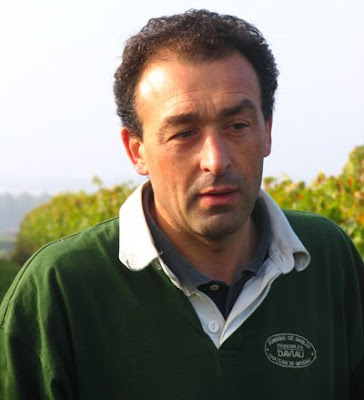 It is just a short drive from Domaine des Rochelles in Saint-Jean-de-Mauvrets across country to Domaine de Bablut (Vignobles Daviau) on the western edge of Brissac-Quincé – the venue for our last visit of the day with Christophe Daviau. The Daviau family have been growing vines here since 1546. They were also millers. Apparently Bablut means two windmills in old French and there still is an old mill on the property, now used a tasting room. At the end of the 19th century the family ceased to be millers and concentrated on vines and wine. 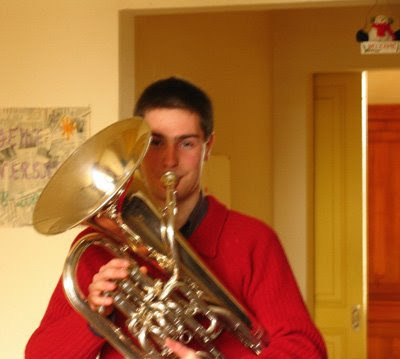 Christophe studied in Bordeaux and then worked for 18 months in Australia. I first met Christophe in September 1989, soon after he had returned to Bablut to take over the reins from his father, Jean-Pierre. Bablut has around 80 hectares, which have been farmed organically since 1996. Our tasting on 31 January started with the 2008 Sauvignon Blanc (VDP) – still in tank and due to be bottled in March, which has attractive grassy and gooseberry flavours. 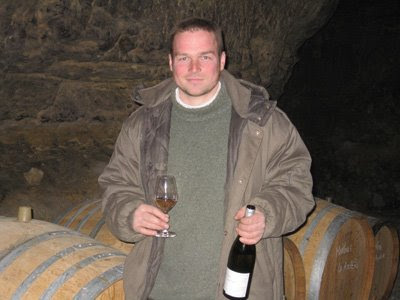 Then on to the mineral 2008 Petit Princé – one of two Anjou Blancs Christophe makes. This is the junior wine, which comes from the well-ventilated plateau at Haut-Perche. Grandpierre, Christophe’s wonderfully minerally and balanced Coteaux de l’Aubance, also comes from this area. Petit Princé is fermented and aged in stainless steel. It matures on its lees, which are frequently stirred to give the wine additional weight. The 2008 will be bottled in June/July of this year. Ordovicien is the ‘grand vin’ blanc sec and comes from vineyards on schisteous soils. Vinified and matured in barriques, Ordovicien is bottled after 18 months. The 2008 is still fermenting but has a promisingly rich structure. The long and slightly buttery 2007 is due to be bottled at Easter. The 2008 Rosé de Loire at 11.5% alcohol was attractively light and fruity. Now made from 100% Grolleau, this used to be a blend with 30% Cabernet. Until recently the Rosé de Loire regulations required a proportion of Cabernet. Fortunately this has now been dropped and there are no minimum or maximum requirements as far as the permitted varieties (Cabernet Franc, Cabernet Sauvignon, Grolleau, Pineau d’Aunis, Gamay and Côt) are concerned. Previously a number of Rosé de Loire producers used to ignore the rules, saving their Cabernet for either their red or Cabernet d’Anjou. The dense, black-fruited 2007 Anjou-Villages-Brissac (70% Cabernet Franc, 30% Cabernet Sauvignon) is still in tank as is the 2007 Petra Alba (100% Cabernet Franc, grown on limestone), which is remarkably concentrated with soft tannins after 70 days of maceration. Bottling is due in March. We discussed best drinking times for the recent vintages and Christophe suggested that it would be best to drink the 2007 and then wait for the 2006, which is high in acidity, and the 2005. 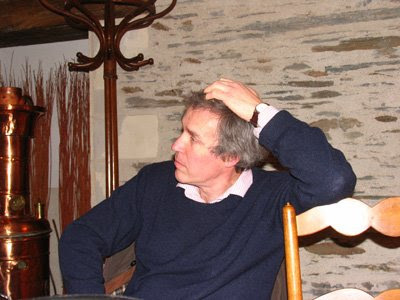 Because of difficult flowering conditions, Christophe didn’t make Petra Alba in 2008 with the grapes going into the Bablut Anjou –Villages-Brissac instead. However, he did make Rocca Nigra (100% Cabernet Sauvignon grown on schist and slate) as his Cabernet Sauvignon flowered in better conditions, although the yield was under 20 hl/ha. Both of these wines are looking promising, although it is still very early days, especially for Rocca Nigra which won’t be bottled until Easter 2010. To finish we tasted 2006 and 2005 Rocca Nigra and Petra Alba. In both cases the Petra Alba showed better at this stage with greater delicacy and balance, although all four are rich, powerful wines. Ideally all of them still need at least another two years in bottle and, in the case of the 2005 Rocca Nigra, a minimum of of three years in Christophe’s opinion. 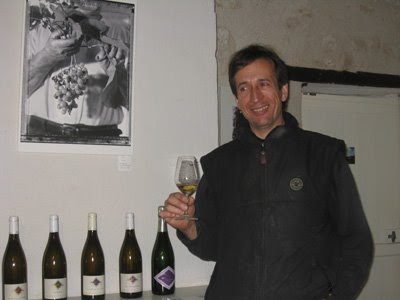 During the course of the interview Nicolas is strong on philosophy and theory but is interestingly vague when asked some specific questions like who else owns part of the La Roche-aux-Moines and who else do you think is making good wine in Savennières. To be fair Gary Vaynerchuk tends to be too quick to interrupt. Nicolas manages to remember that Pierre Soulez used to own part of the Roche aux Moines but fails to mention his neighbour, Madame Laroche, who he once took to court over the use of the name Roche aux Moines. Nor does he mention Claude Papin, who also has vines there. Well worth reading in conjunction with Gary and Nicolas' chat is wine doctor Chris Kissack's updated profile of La Coulée de Serrant. Chris gives careful consideration to the divided opinions over the perceived quality of the estate's wines and looks at the wine-making methods used. It would be interesting to see what the results would be if someone like Noël Pinguet or Jean-Pierre Chevallier were put in charge of wine-making at La Coulée. 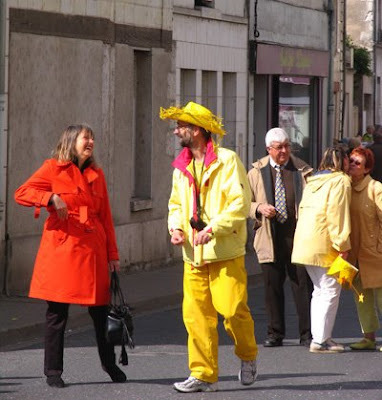 La Nouvelle République carried a report today on last Saturday’s saffron fair at Preuilly-sur-Claise in the depths of southern Touraine. The fair attracted more than 1500 visitors, although not many will have bought an entire kilo at 30,000€ for the full 1000 grams. Fortunately a little goes a long way! More information about growing saffron here and here, admittedly slightly out of area but it is in La Creuse, whose water flows through part of the Loire before joining the Vienne. The saffron farm at Fontanières is also not far from the upper reaches of the River Cher. 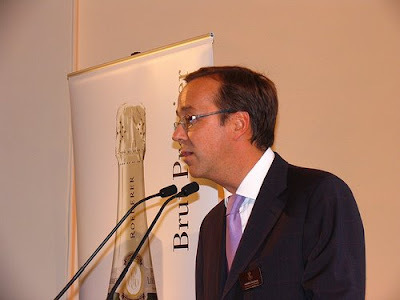 Louis Roederer are now inviting entries for their International Wine Writers' Awards. There are seven categories including Category 5: Online Wine Writer of the Year 2009 – for entries on specialist websites or blogs. 'Louis Roederer is pleased to announce the fifth Louis Roederer International Wine Writers’ Awards and is now inviting entries from writers and broadcasters worldwide, whose main profession is writing or broadcasting about wine. The winner of each category will receive £1,500 and a magnum of Louis Roederer Cristal. Where more than one writer is named on the work, the prize will be shared. 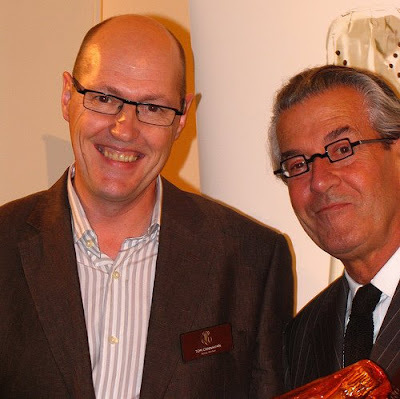 Tom Cannavan (wine-pages) winner in 2008 of the first on-line wine writer award with Michel Janneau, deputy managing director of Louis Roederer. Different hair styles but they obviously use the same optician. Gary Vaynerchukt (The Wine Connoisseur) interviews Nicolas Joly (on YouTube): 26 minute clip. Although I'm not sure that calling Nicolas a 'certifiable wine legend' was the happiest choice of words. Chenonceau – the Loire's most beautiful château? 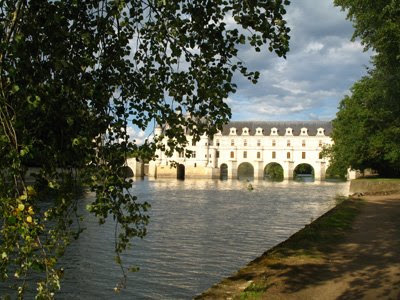 Of all the châteaux in the Loire the gracious Chenonceau is my favourite. Not only is it wonderfully elegant arching across the River Cher (hardly surprising that a series of women were its principal creators) but it is just about imaginable that one could live there. In marked contrast to the gigantic and excessive Chambord build not for comfort but to impress, only the moated Azay-le-Rideau runs a close second. It was also at Chenonceau that some of the first Chenin Blanc was planted in Touraine, by François I in the early 16th century, some time after it was planted at Cormery by the eponymous Bishop allegedly at Mont-Chenin around the middle of the 15th century. 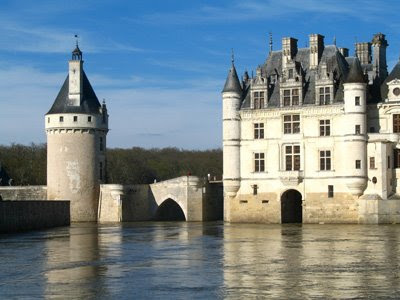 For many years Château de Chenonceau made its own wine, vinified in one of the old buildings in the grounds into which they had ingeniously crammed modern vinification equipment such as temperature controlled stainless steel vats. 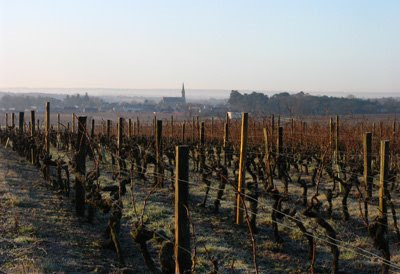 The vineyards now are looked after by, and the wine made by, Bougrier in La Chaise, part of Saint-Georges-sur-Cher. Some of the best views of the exterior of the château are from the small track that runs along the south bank of the Cher, which is where these views were taken. 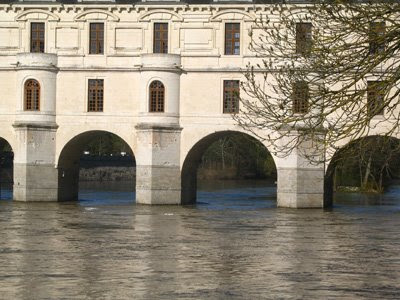 During the lifetime of Vichy France during the Second World War the River Cher was the border between German occupied northern France and Vichy France and the château was an escape route to relative freedom. 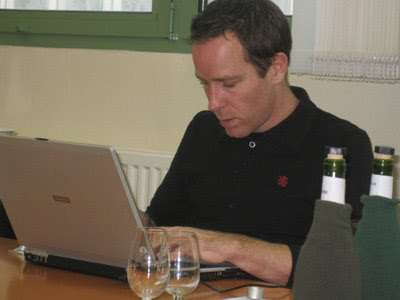 This week there has been an interesting discussion on Tom Cannavan’s Wine-Pages entitled ‘Parker's a great wine journalist’. It illustrates the two different approaches to writing about wine. ‘I'd suggest that the topic should be entitled why Robert Parker is a 'great wine writer' rather than a wine journalist. As a broad generalisation a journalist reacts and comments on current events, while a writer takes a more reflective look. I consider Hugh Johnson to be a writer, while Tim Atkin is mostly a wine journalist. Andrew Jefford and Jancis Robinson are both writers and journalists. This thread illustrates a fundamental difference of approach that exists in those whose write or commentate about wine. Seeking a catch phrase – bottle or terroir. 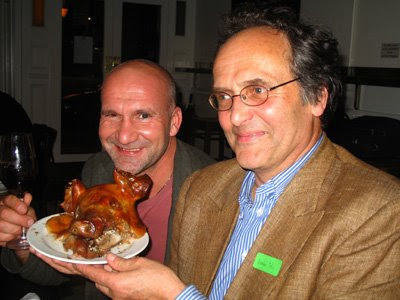 Robert Parker and Malcolm Gluck, for example, see themselves as wine critics where what is in the bottle is primordial. A detailed knowledge of the soils and the personalities involved is not essential and can get in the way of an objective assessment of the wine. The terroir approach is exemplified by Hugh Johnson, Anthony Hanson and Andrew Jefford where an understanding of the wine comes from an interest and knowledge of the area, where the vines have grown and the personalities of those who cultivated the grapes and made the wine. I think both approaches have their strengths and both are valid. I am certainly in the terroir camp because, for me, looking at where grapes are grown and the personalities involved is fascinating. In the case of the Loire this may make me less critical of certain wines than I might be if I tasted them miles away. The 'bottle' camp would I'm sure say that I'm too emotionally attached to the Loire and its producers to be properly objective. Although I think it was James Cameron who thought that good journalism demanded some involvement. I have to leave readers to form their own judgments over whether they agree with my conclusions or not. Tasting is extremely personal and wines and our perception of them change all the time so, for me, a tasting note is just a snapshot. I only use points/marks when I'm obliged to in wine competitions although I do use a system of ticks, crosses and question marks when tasting wine, which I'm sure wouldn't stand even the briefest scientific scrutiny. Obviously Jim’s Loire is unashamedly and unapologetically ‘terroir’ driven. 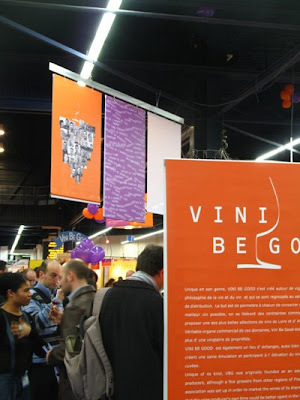 On Friday 20th February Le Conseil d’Etat, France’s highest court, annulled the statute that set up Vignobles de France, a vin de pays designation that covered most of France’s wine producing regions (64 départments) thus allowing blending across regions. 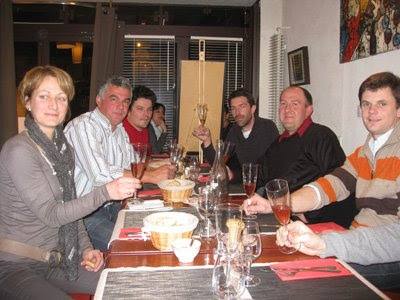 Vignobles de France was set up on 28th February 2007, following a proposal from Viniflor (Office National Interprofessionnel des fruits, des legumes, des vins et l’horticulture). The legal challenge was brought by the Fédération Régionale des Vignerons Indépendants du Languedoc-Roussillon, Le Syndicat des Vignerons de l’Hérault et L’Association La Cause du Vin, who felt you couldn’t have a vin de pays that covered most of the whole country. 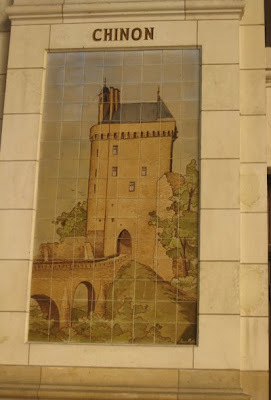 Also the vin de pays producers of the south of France believed that Vignobles de France would compete with their wines. The EU had had similar doubts about the legality of a countrywide vin de pays and refused to publish details of the Vignobles de France. 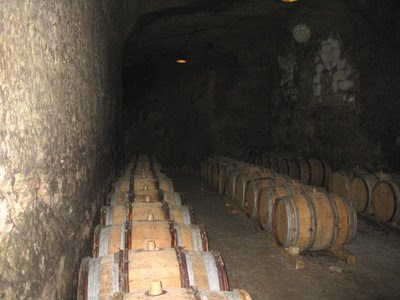 In its short life 70,000 hl of Vignobles de France were produced. This is yet another example of an attempt to reform the French wine industry that has got nowhere. Over the past 20 years various reports have been produced, proposals made and so far nothing. The predecessor to Vignobles de France was Cépages de France and was another attempt to facilitate the sort of cross-regional blending that has always been possible in Australia and which might assist France in building large volume brands to compete in the world market. This proposal was also killed off by opposition from producers in the Midi. The reclassification of the Bordeaux’s Cru Bourgeois and the Grand Cru Saint-Emilion were also knocked out by legal challenges. A lethal combination of the French Government and the French wine producers seem to be happily tearing off the wheels of the French wine industry bus as it hurtles over the cliff. 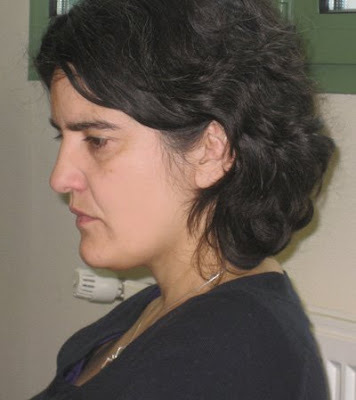 Sarah Ahmed, the wine detective and recent winner of the Annual Portuguese Wine Awards Wine Writer of the Year 2009, has just published her notes on wines tasted both at the Salon des Vins de Loire 2009 but also her trip to the Loire last August. Following a very enjoyable lunch – simply but well cooked (Catherine Ogereau always promises us a simple meal with no starter but cheese and dessert always follows the main course) – it was off to the Lebretons at Domaine des Rochelles in Saint-Jean-de-Mauvrets close to the Loire and north of Brissac-Quincé. 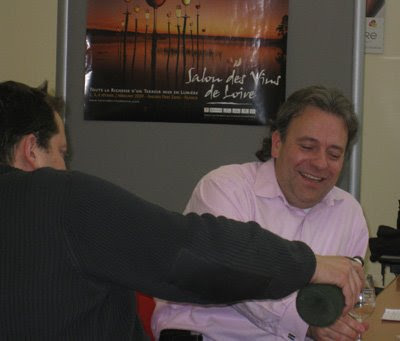 Here Tom King (RSJ Wine Company) and I were looked after by Jean-Hubert Lebreton. Jean-Hubert used to be the assistant-wine maker at Hardy’s Banrock Station in Australia, where just one tank held more than the entire production of Domaine des Rochelles. On average the Lebreton’s press 700 tonnes of grapes – at Banrock Station it was 35,000. He also worked in Bordeaux at Pichon-Baron and Lynch-Bages. 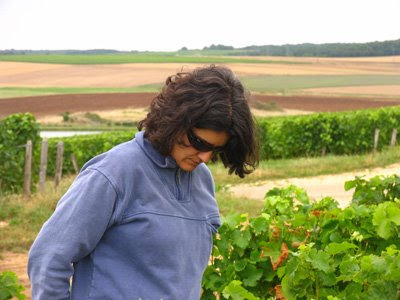 As elsewhere the Lebretons had a small crop in 2008 – down overall by 15%-20% due to a combination of frost damage, poor flowering and small grapes with little juice. Normally they make 350-400 hls each of Cabernet Franc and Cabernet Sauvignon, making a total of around 800 hls of Anjou Villages. In 2008 they made only 180hls-200hls of each. Jean-Hubert mentioned that they are now selling 240 hls of VIn de pays Sauvignon in bag-in-box. The 2007 la Croix de la Mission (90% Cabernet Sauvignon/10% Cabernet Franc) has pretty impressive richness and structure for a 2007 with remaining soft. Jean-Hubert: “2007 wasn’t easy. The Cabernet Sauvignon was picked some 10 days after the Franc – the yield was 45 hl/ha. With Cabernet Sauvignon it is possible to push the maturity further than with Cabernet Franc because Franc’s skin is not as tough and robust. The wine had three weeks maceration. The 2008 La Croix is very deep coloured with sweet, richly concentrated fruit with good length. A this stage it is a bit cloying but is still has a long way to go before it will be bottled. Onto the very rich and powerful 2005 Les Millerits, Anjou Villages, which comes in at 15% with blackcurrant and coffee notes. Still too young, this needs leaving in the cellar for at least another three or four years. Les Millerits is 100% Cabernet Sauvignon from a vineyard planted on friable, yellow schist. In contrast the 10 ha La Croix de la Mission is on quartz-red schist. It is aged for 18 months in barrels – partly new, partly one wine and partly two wines. The infant 2008 Les Millerits is like the 2005 – dark and brooding, with very rich, concentrated fruit and unlikely to be ready to drink before 2015. Tasting these powerful Anjou-Villages Cabernet Sauvignons is once again a reminder that you can get good results with Cabernet Sauvignon in Anjou but that it is very site-specific. To get ripe fruit you need a warm soil, so that the vines get off to an early start. Planted in cold soils it is very rare to get ripe Cabernet Sauvignon here. The Lebretons are fortunately to have some of the best vineyards for CS in the area. Finally onto the sweet wines with the quite rich, nicely balanced and citric 2007 Coteaux de l’Aubance the first up. This is fermented and aged in 400 litre barrels. Not super sweet but one to enjoy as an aperitif or with blue cheese. The agreeably citric 2008 is lighter and without the same length as the 2007. 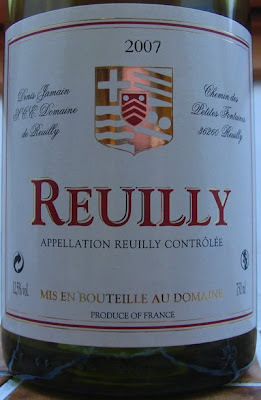 It illustrates that 2008 is not a sweet wine vintage in the Loire. Providing you don’t pay very much for them, there are some perfectly pleasant wines to be enjoyed young and drunk as aperitifs or with rich pork and chicken dishes. We finished by tasting the rich and concentrated 2007 L’Ambre, the Lebreton’s top L’Aubance with its fine peach and apricot flavours. Unsurprisingly L’Ambre was not made in 2008. We talked about the rumours of some Anjou producers turning in 2008 to osmosis machines to try to make sweet wine without taking risks. Picking at 14%-15% potential and hoping the machine would work its magic. I guess this is an unfortunate illustration that despite the big renaissance of sweet wine in Anjou over the last 15 years that there are still producers who think that osmosis machines or chaptalisation for sweet wine are acceptable. They are not and we agreed that the sooner Anjou bans chaptalisation for sweet wine the better. Apparently the L'Aubance producers are considering banning chaptalisation – bravo I hope they soon take this long overdue step. Le Figaro reports this morning that France’s Minister of Health, Roselyne Bachelot, has argued for a reasonable, cultural and balanced approach to drinking alcohol. And that her measures to ban ‘free drinking’ in ‘open bars’ will not restrict tasting at amateur or professional wine fairs. As France is a wine producing country it would be impossible and unthinkable to ban wine. Bachelot says that she has never seen wine producers offer as much wine as you want rather that they give only small samples to taste. She also says that she is in favour of allowing advertising for alcoholic products on the net but under ‘drastic conditions’ – no spams, no pop-ups and not on sites directed to the young or sports sites. She would have a watchdog to follow everything to do with alcohol on the net. I have to wonder why it has taken Roselyne Bachelot so long to make her position clearer. It could be good news about alcohol and the net but it depends upon the detail of the 'drastic conditions' and the powers and scope of her watchdog. 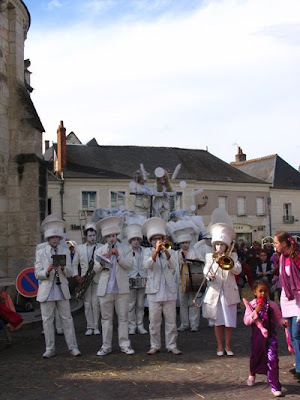 Better late than never, and apologies that I didn't notice it before, but yesterday was the 10th annual 'foire au safran' held in Preuilly-sur-Claise. Anyway a reminder that Touraine is a producer of saffron. Details on the Les Saveurs du Val de Loire blog. The reports on my visit last Wednesday to Laurent Chatenay and Xavier Weisskopf are now complete. 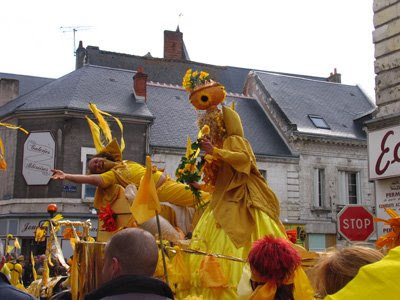 Yesterday's edition of La Nouvelle République reported that after several setbacks the Harley Davidson Rally, called the American Loire Valley Festival, will take place in Luynes at L'Espace des Varennes from 29 to 31 May. Luynes is on the north bank of the Loire about 12 kilometres west of Tours. This will be the fifth edition. The festival was held every year from 2002 with a break last year. According to NR some 3000 bikers and their Harleys are expected, attracting around 10,000 visitors. However, this seems a pretty conservative estimate compared to the reports of the numbers at the previous editions of the festival attracted. Further details available here. To be fair the wine's colour was darkened by the flash and has been tweaked by Photoshop, although the actual colour was slightly lighter but the wine was just as muddy. During dinner with the Cabernet Franc Ambassadors we tried a few other wines as O'Bistro has an interesting and eclectic list. The last 'wine' was the most memorable for all the wrong reasons. From Jean-Christophe Garnier, and apparently made from 100% Grolleau, this is a textbook example of the type of wine that gives 'natural wines' a bad name. Described as a vin mousseux de qualité (quality sparkling wine), it was light brown in colour and distinctly cloudy. Indeed far more reminiscent of rough farmyard scrumpy than a sparkling wine. As it is virtually undrinkable I can only assume that this is a sophisticated joke by Monsieur Garnier of Saint-Lamber-du-Lattay – otherwise how could you put such a faulty and poor wine on the market? Equally I can only assume that this is the reason that it is probably stocked in 'cutting edge' wine bars. The alarming thing is that I'm pretty sure that this is not the worst wine that I have tasted from Jean-Christophe Garnier as he exhibits every year at the Renaissance des Appellations. I'm not against 'pushing the envelope', exploring the limits, but you have to be able to recognise when something is a miserable failure. Several around the table questioned how this could be possibly described as 'mousseux de qualité', even 'vin' and Jean-Christophe calling himself a 'vigneron' raised eyebrows. Before we were served the excerable mousseux we were served a couple of reds blind. The first was considerably lighter in colour than the Cabernet Francs we had been enjoying. I thought it was from the Loire and opted for a Pinot Noir from the Central Vineyards as did Gérard Vallée. Perhaps I should have been more courageous and plumped for a Sancerre, which, in fact, it was – 2006 Terre de Maimbray from Pascal and Nicolas Reverdy. The second was similar in colour but a little lighter in body. I surprised myself by guessing that it was a blend of Gamay and Pinot Noir. Actually it was 2007 Les Andilles, Cherveny from Hervé Villemade – 80% Pinot Noir 20% Gamay. Pleasant enough but not memorable – still it was 2007. Jérome felt that the finish was bitter. Really fun evening in the company of six Cabernet Franc Ambassadors from the selection made in Paris last April, when the 2007 and 2006 vintages were tasted. We tasted and dined at O 'Bistro close to Les Halles in Tours. O'Bistro only has a few tables, so booking is advisable. Organised by Pierre Pichot of Interloire, the following kindly brought over their wines for me to try or, strictly speaking, retry as I was on the panel in Paris that selected the Ambassadors: Carine Reze (Mabileau-Reze – Vignoble de la Jarnoterie, Saint-Nicolas-de-Bourgueil), Gérald Vallée (Domaine de la Cotelleraie, Saint-Nicolas-de-Bourgueil), Wilfred Rousse (Chinon), Philip Boucard (Lamé Delisle Boucard, Bourgueil), François-Xavier Barc (Domaine Charles Joguet) and Jérome Billard (Domaine de la Noblaie, Chinon). The spirit of moderation soon spread to a neighbouring table in the tiny restaurant as the Ambassador wines were sampled. A brut sample of Wilfred's easy drinking cuvée printemps, which will be bottled in April. Coming from vines on the sand and gravel soils of Saigny-en-Véron, this has only five days of cuvaison so the accent is very much on the fruit. Another brut sample, sweet ripe fruit, balance and length certainly impressive for a 2007. Much more structured cuvée from Wilfred from nearly 20 year old vines planted on clay and flint at Chinon. Again a brut sample but looking promising. From vines on clay-limestone at the base of the coteaux. Combination of sweet, ripe fruit and quite tannic structure needing a little more time. Rich, mouth-filling fruit, concentration and length. Sleek and modern. A real contrast to the Chinon from Jérome's Chinon, this has a rather more rustic feel but with rich fruit, complexity and good length. A wine that should age well. Fascinating to have the two very different wines together – both good but gloriously different. Modern soft style packed with violets for the entry cuvée to the Joguet range. From vines planted at Beaumont on sand and clay. This was one of the stars of last April's tasting and it still shining brightly. From vines planted in 1991 it had five weeks of maceration and was then aged in Burgundian barrels that had had one sole use – just six months. A modern style – rich and concentrated with notes of coffee and considerable length. This comes from ungrafted vines that Charles Joguet planted twenty years ago. Sadly they had to be pulled out in July 2008 as the phylloxera that first started to appear in 2003-2004 proved to be uncontainable. It has soft, rich fruit with a particulalry attractive, velvety texture. Further confirmation that François-Xavier has put the Charles Joguet domaine back amongst the leaders of the appellation after its slump following the retirement of Charles. See also a report on the Lame-Delisle-Boucard blog. On the way to the restaurant Pierre Pichot and I dropped into mille et un vins, a small, friendly wine shop with a good range of wines, run by Henri Clément. Following a further tasting this morning at the offices of Interloire in Tours, we finalised the selection of the Sauvignon Blanc Ambassadors for 2008, the first year of the project. The panel of five headed by Sam Harrap MW with Sarah Ahmed (the wine detective and recent winner of the 2009 annual Portuguese Wine Awards Wine Writer of the Year), Joe Wadsack (formerly a wine buyer for Waitrose and now a media star), Henri Chapon (formerly wine buyer for the Hotel du Vin chain in the UK) and myself tasted all of the wines at least once. Those that were eliminated were only rejected if there was complete agreement. Any, over which there was a difference of opinion, were retasted, some several times. This morning all the wines that we had provisionally selected yesterday were retasted. Where there was complete unanimity that they were of Ambassadorial quality they went through. Where the panel was split, these were retasted and discussed at length. All in all, this was a very thorough exercise with the jury impressed with both the quality of the wines selected and with the variety of styles from the herbaceous and grassy through citric to ripe tropical fruit of mango and guava. There are 29 Sauvignon Blanc Ambassadors for 2009 with wines coming from the Pays Nantais through to eastern Touraine out of around 75 submitted – 38.7%. Given that this is the first year of the project this is a pretty good start. Certainly the good conditions in September and October 2008 helped, although the vintage was not straightforward for Sauvignon Blanc. The list of wines selected will be published on Jim's Loire as soon as the growers involved in the SB project have been informed. I hope that it will be possible to promote Cabernet Franc and Sauvignon Blanc Ambassadors jointly as this will give both selections more punch. Another very enjoyable meal last night. This time at Au martin bleu, close to the main station of Tours, where fish is a speciality. We started with a Vouvray méthode traditionelle from Allias, followed by the very good 2007 Bel Air Touraine-Amboise from Damien Delecheneau's La Grange Tiphaine and then an excellent 2005 Clos Picot Savennières fromn Yves Guengniard of Champs-sur-Layon. The Allias rather split the table – some liked, while Sarah and I would have preferred a lower dosage. Despite no longer living in Skegness Joe Wadsack was his customary ebullient self – demonstrating once again what an amazing memory he has for wines and meals that he eaten: able to remember details from at least fifteen years ago. We did the first part of the tasting to select the initial Ambassadors for the Loire Sauvignon Blancs this afternoon at the offices of Interloire in central Tours. We selected just over 50% of the samples presented to go forward to be retasted tomorrow morning, so that we can make a final selection of the Loire Sauvignon Blanc Ambassadors from the 2008 vintage. Naturally all the wines were tasted blind and we were looking for wines that would have a place in the UK market. Of those that failed to make the cut, some were faulty – mainly reductive, while most of the others tended to be either unripe with aggressive greenness or were dilute. 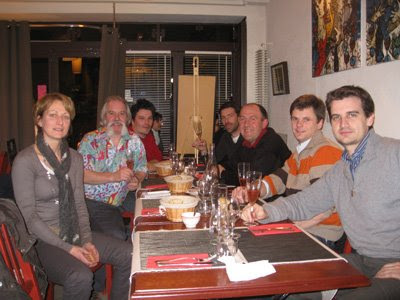 Very enjoyable dinner with Sam Harrop MW, Elodie Bessas and Pierre Pichot at L'Hédoniste in Tours. We chose a bottle of Vincent Gaudry's very minerally and pure Le Tournebride Sancerre 2007, which developed weight in the glass. Vincent is based in Sury-en-Vaux and his wine reminded me of those of François Crochet. L'Hédonisme lists only natural wines and their very interesting lists includes many of the usual suspects. Will be tasting 2008 samples from the Sauvignon Blanc project this afternoon along with some Cabernet Franc and Côt. 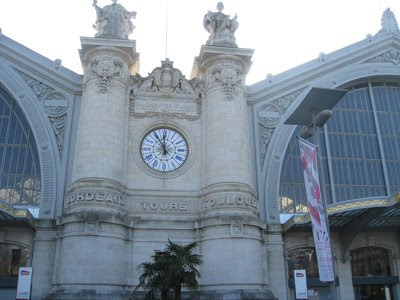 Now in my hotel in Tours (Best Western Central Hotel: 02.47.05.46.44) having arrived at the Tours main station around 3pm. The station at Tours is a really magnificent building and recalls the golden years of the railways in the second half of the 19th century. 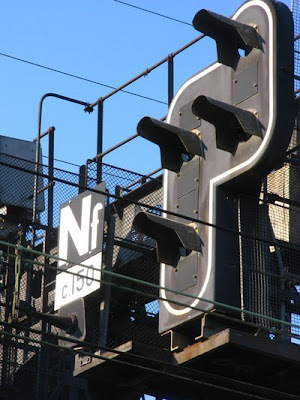 Certainly well worth going to see even if you have no intention of catching a train. The good news at the hotel is that there is free WiFi in the rooms and that it works. I hope hotels, including the Hotel Panoramic in Sancerre, that levy eye-wateringly high charges for internet access note that it is increasingly the norm for hotels to offer free access. 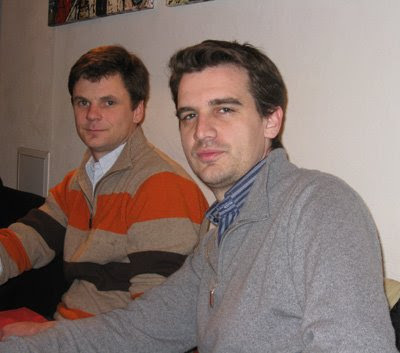 As posted yesterday two visits this afternoon to 'newcomers' to Montlouis – Laurent Chatenay and Xavier Weisskopf. My first visit was to Laurent Chatenay, who starting in 1996 and is one of the first of newcomers to Montlouis that have helped to make this a very dynamic appellation. Prior to taking over from his father-in-law on his retirement, Laurent worked in industrial design. Laurent’s father-in-law had bottled very little of his wine instead selling it in bulk to négociants. 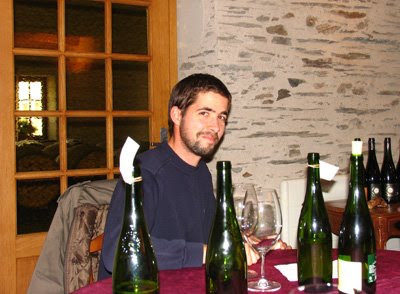 When Laurent took over the 7ha of family vines he started bottling and also moved rapidly to organic viticulture. By 2000 he had stopped using any chemical products in the vineyard. 1n 2003 Laurent applied for the Ecocert certification and this was granted in 2006. His seven hectares, in twelve different parcels, are on the Cher side of the appellation. The sub-soil is clay and flint overlaid with around 110 cm of sand. “Makes it very easy to work,” Laurent. He did expand up to 13 hectares but decided that this was too big and he didn’t enjoy having to manage the people he needed to employ to look after the larger area, so has now gone back to seven hectares. Laurent: “Most of my vines are between 40 and 90 years old, although I have one parcel of young vines that were planted seven or eight years ago. My yields are around 35 hl/ha and my annual production is around 30,000 bottles. Laurent sells 70% of his production from the cellar door and through the shop in Montlouis at 73 Quai Albert Baillot that his wife runs. As well as stocking the domaine wines they also sell a range of organic wines from the Loire. We started our tasting with the soft and creamy 2007 Pétillant Naturelle Extra Brut, which also has a quite attractive mineral finish. Then onto the crisp, lemony and commercial Méthode Traditionelle. About 50% of Laurent's production is sparkling. He would prefer that he made almost entirely still wine but recognises that there is a good market for sparkling wine and that you need something that will pay the bills. Next we looked at a tank sample of 2008 Les Quarts de Nouy, which will be bottled in March. Picked on 7th/8th October it is soft and citric, pure with an attractive mineral finish. The 10 grams of residual sugar provide a good balance for the acidity. This Laurent’s only still cuvée that is not fermented in wood. The 2008 Les Quarts de Nouy and the MT sparkling will soon be available in the UK through Novum Wines, whose wine buyer is Steve Daniel. Steve used to buy for Oddbins in its heyday. Steve is working with Thierry Merlet, who used the winemaker and involved in the Levin venture near Montrichard, on this and some other Loire projects. Onto 2007 Les Maisonnettes, which spends a year in barriques of two to six passages of wine through them. This was the first of Laurent’s wine where the nose was pungently Chenin – rustic notes and lacking the purity and precision of his 2008 Quarts de Nouy or the precision that is invariably in the Montlouis of producers like Jacky Blot. 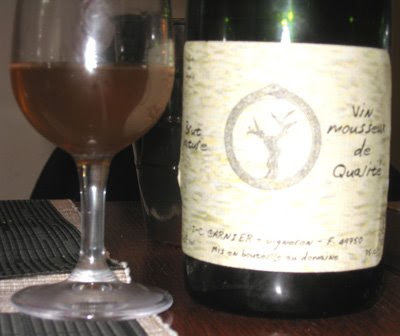 The 2007 is quite rich (13.5% alc) and it may be going through an awkward stage but the rustic notes worry me, especially as they were present on the 2007 La Vallée Demi-Sec and the 2003 Les Quarts de Nouy Moelleux. In contrast I liked the 2007 Les Hauts de Cangé (14€), which was fermented in new barrels. It has good weight, concentration, some barrel spice but not dominant, and good mineral length. Will benefit from a couple of years or more in bottle. As already mentioned the light gold 2007 La Vallée demi-sec (10€) has rustic, slightly unclean Chenin aromas. The palate is better with a typical touch of bitterness in the finish, which I find attractive. 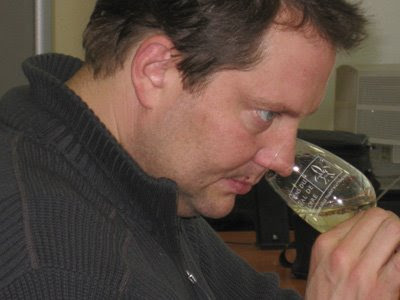 50% of the wine went through an involuntary malo, which Laurent would have preferred to have avoided. Of the two 2003 moelleux tasted I much preferred the more expensive and concentrated La Vallée aux Prêtres (18€) with 190 gms of residual sugar with its butterscotch flavours. Still a little bit dominated by its sugar, this is certainly a bottle can laid down and enjoyed in the decades to come. As already indicated the 2003 Les Quarts de Nouy lacks some purity and precision. In 2003 Laurent made another moelleux Le Clos Michot picked at a potential alcohol of 24%, this has 245 gms of rs from passerillage. Sadly it is now sold out but I have drunk it and was certainly impressed. Following the visit I’m left with the impression that Laurent’s wines could be better. There is an inconsistency here, which is shown by the rusticity on some of the wines. Whether this is due to the need for a more rigorous grape selection in the vineyards for some of the wines or, perhaps more likely, something in the cellar that needs tightening up I don’t know. This is a pity as I sure the approach is right. It seems likely that Xavier is the most recent of the group of newcomers, who have turned Montlouis into such a dynamic appellation. Possibly Xavier may have to share that distinction of newness with Elise Brignot in Dierre. Xavier created his 13 hectare estate in 2005 after working as chef du cave for Louis Barroul at Château Saint-Cosme in Gigondas. Despite his recent arrival Xavier already has an enviable reputation for his wines. This visit was my first chance to taste Xavier’s wines and it was soon clear why he has been making echoes – I was impressed, particularly with the purity and precision of the wines. Unlike many of the other newcomers Xavier is from the world of wine. He hasn’t made a career change. Born in the north of France he went to school in Chablis and then to wine school in Beaune. 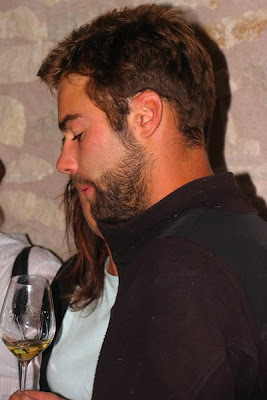 During his four years in Gigondas he became frustrated that the region was really too warm for whites – or, at least, the whites he wanted to make. Furthermore Xavier is particularly passionate about Chenin Blanc. Of his 13ha, 9.5 are AC Montlouis with vines in Lussault-sur-Loire (3ha: argile-calaire) and Saint-Martin-le-Beau (6ha: flint and clay). The rest is AC Touraine with some Sauvignon and 24 ares of very old Côt that was planted in 1891. This is one of a few parcels of very old Côt (all over 100 years old) in this area – others include Damien Delecheneau at La Grange Tiphaine (Amboise) and the Clos Roche Blanche at Mareuil-sur-Cher. Xavier explained that Didier and Catherine (Clos Roche Blanche) had told him that their old Côt was called ‘de Montlouis' (from Montlouis). So it would appear that the plants originally came from the Montlouis area. Of course this was long before the appellations were established and Montlouis whites would often have been sold under the Vouvray name. Xavier has amazing cellars tunnelled out of the limestone hillside on the Rue Rocher des Violettes close to the Château d’Amboise. Originally a quarry for building material, it was then used by wine producers but abandoned in the 1920s. When Xavier took it over it was full of old wine implements including an old vertical press but, because of the cellar’s humidity, everything had rotted and unfortunately nothing was salvageable. The first wine tasted was 2007 La Touche Mitaine (10€) from vines around 30 years old grown limestone and flint soil. Vinified and aged for 12 months in pièces bourguignon, I found this very pure and mineral, although Xavier thought there was a little reduction and that it wasn’t tasting as well as a few weeks before. Then 2006 La Négrette (13€) from old vines on clay-limestone soils. Xavier: “Très tardive.’ (Very late to mature.) 25% in new barrels, in wood for 16 months, then five months to settle in tank before bottling.” La Négrette has lovely purity and the sort of austere precision that I love in Vouvray and Montlouis. Although there is no malo, I found just a touch of butteriness in the finish. The 2007 Montlouis Demi-Sec (10€) with 13 g of residual sugar – just into the demi-sec category – and vinified in tank. This has similar purity and precision with a mineral finish allied with a characteristic touch of bitterness. There is also a hint of honey in the aftertaste. Next the 2006 Pétillant Naturelle (11€) 24 months sur latte and degorged on 15th November 2008. Despite its honeyed nose I found Xavier’s Pét-Nat drier and more mineral in style than the one tasted at Laurent Chatenay. We finished with the 2007 Bel Air Côt Vieilles Vignes on sandy, flinty soil. Xavier is experimenting with the best way of vinifiying his Côt. For the first vintage he used carbonic maceration (the method used to vinify Beaujolais) to emphasise the fruit. 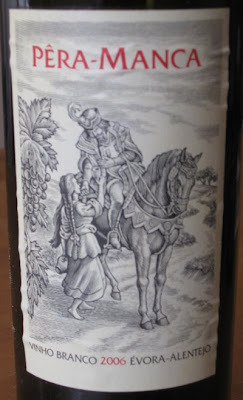 This 2007 was classically vinified and for 2008 Xavier went back to carbonic maceration. The 2007 Côt is deep coloured with a gamy nose. It needs more time and I was less convinced by this than by Xavier’s Montlouis. Xavier plans to plant another 50 ares of Côt this year using a sélection masale. We talked about various clones of Côt and Xavier mentioned one called Côt Madelaine that produces large quantities of fruit that is ripe at the end of August but not quality wine. Around 60% of Xavier’s production is exported to the US, Canada, Germany, the UK (Decorum Vintners) and Belgium. Early start tomorrow as heading back to the Loire – to Tours for the Sauvignon Blanc project tasting. As I get there earlier there are two visits in Montlouis set up for me – to Laurent Chatenay, whose wines I've tasted and enjoyed, and to Xavier Weisskopft (Le Rocher des Violettes), whose reputation I know of but whose wines I have not yet tasted. Should be a good afternoon. 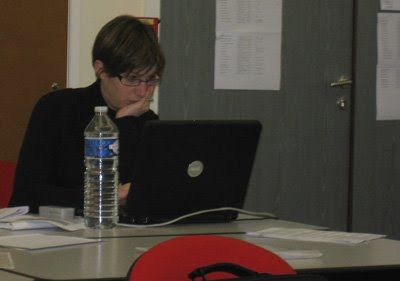 Then will be hooking up with Sam Harrop MW and Elodie Besseas, in charge of the technical aspects at InterLoire. Our next stop was just across the Layon to Domaine Ogereau in Saint-Lambert-du-Lattay. Catherine and Vincent are close friends of Claude and Joëlle Papin and they work together in Savennières on the Clos le Grand Beaupréau venture along with Yves Guignard of Domaine de la Bergerie in Champ-sur-Layon. For the first time Emmanuel, their son, joined us for the tasting. He is now in the middle of his wine studies and is hoping to be able to arrange a stage (work experience) in Oregon. Vincent started by saying that in 2008 they had only made around 50% of their normal volume, which is never excessive. They expect to make 850/900 hectolitres a year – in 2008 they made only 600 hls. As usual we tasted through the range – some 2008s plus other vintages – with everything meticulously organised in advance. We tasted the rosés and reds before turning to the whites. Also as usual there wasn’t, with one notable exception that I’ll come to later, a poor wine amongst them. Particular favourites that I picked out were: 2008 Cabernet d’Anjou: all pretty red fruits and a pure, fresh finish. 2007 Anjou Villages: quite rich for a difficult vintage. The tannins are still a little edgy, so this ideally needs another year or two in bottle. However, equally, with food I’m sure it will be fine now. 2005 Anjou Blanc Prestige (100% Chenin Blanc): while the ‘basic’ cuvée includes 20% Chardonnay. The Prestige 2005 is rich and concentrated and has thrilling energy and precision in the finish. In comparison the 2006, tasted next, although richer and fuller even than the 2005, is more ponderous. 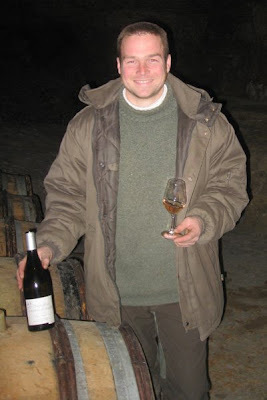 2007 Anjou Blanc Prestige: very promising – the volume of 2006 with the energy of 2005. 2008 Coteaux du Layon Saint-Lambert-du-Lattay: citric – hints of lime, apple too. An attractive, easy-drinking Layon and picked before 20th October. The good autumn weather of 2008 came to an abrupt end in early November whereafter it rained almost every day for the rest of the month dashing hopes of some very good sweet wines. Vincent showed us what they had picked in mid-November. Even though these grapes had a potential alcohol of 17% the result was dilute not fully clean. Fascinating to taste the two different cuvées. Needless to say the second won’t be appearing under the Ogereau name but will be sold off in bulk. 2007 Coteaux du Layon Saint-Lambert-du-Lattay: wonderful purity showing the hallmark of the 2007 vintage with rich peachy fruit and citric flavours. A marvellous pair of rich sweet wines with the 2003 very rich and concentrated but with good freshness in the finish. “It’s beginning to eat some of its sugar,” observed Vincent. At the moment the 2005, with its honey and citric purity and balance, has it over the 2003 but in the long haul, I wonder. We finished with the 2007 Bonnes Blanches Coteaux du Layon Saint-Lambert-du-Lattay with its exotic fruit, especially passion fruit. It’s good but decidedly overshadowed by the 2003 and 2005. Following a very enjoyable lunch – simply but well cooked (Catherine always promises us a simple meal with no starter but cheese and dessert always follows the main course) it was off to the Lebretons at Domaine des Rochelles in Saint-Jean-de-Mauvrets close to the Loire and north of Brissac-Quincé. 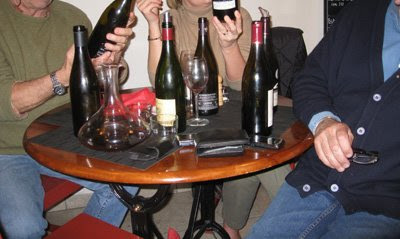 With the French parliament discussing various changes to the law concerning alcohol, some of the measures proposed being draconian like the proposal to have a blanket ban on free wine tasting, Hervé Lalou has posted a piece asking why so many of the deputies, mayors and politicians who represent French wine regions have been so timid and reluctant to speak up on behalf of their wine producers. Hervé also castigates the French press for their timidity. 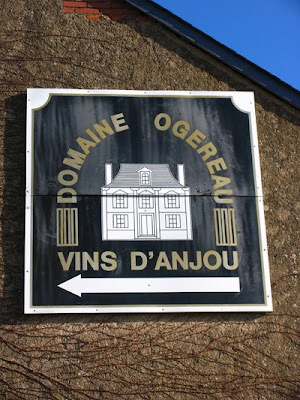 Today's posting on Peter Liem's Besotted Ramblings is a fascinating and carefully considered report on a recent visit to see Louis-Benjamin Dagueneau at Domaine Didier Dagueneau. Peter sensed that Benjamin is in control of this very difficult and demanding situation. This was my impression when I dropped in briefly with Benoît Roumet of the Bureau du Centre in early October during the vintage. Telegraph scoop: Savennières turns to Sauvignon!